Surrounded by thousands of acres of nature preserves, Lodi is paradise to avid birders and nature lovers. Every Fall, THousands of greater and lesser Sandhill Cranes arrive in the California Delta, ready to spend their winters vacationing near Lodi. 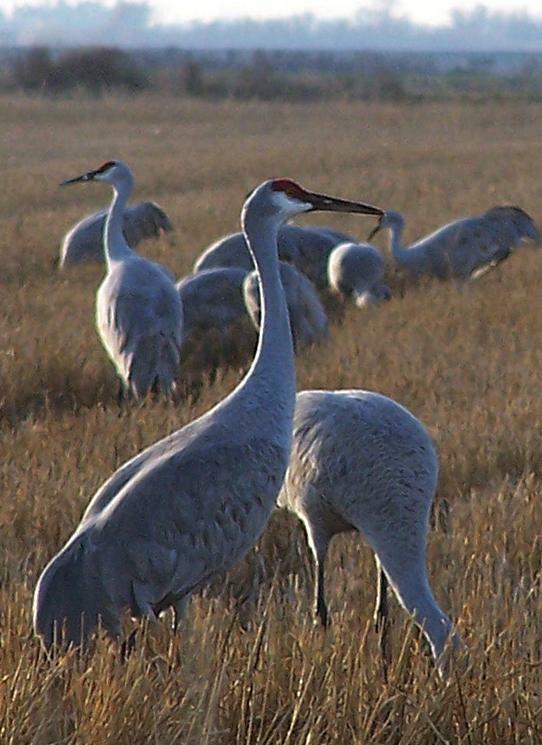 For 22 years, The Sandhill Crane Festival has celebrated the ancient birds’ arrival, along with the wildlife and natural beauty of the Lodi Area. Whether you are here during the November festival, or throughout the fall, here are the top ways to birding and outdoor activities to experience while you’re here. This river-rich basin, coupled with marshes teeming with life, is home to hundreds of species of birds, mammals, amphibians, reptiles, and fish. During the winter months, the Sandhill Crane arrives, offering individuals an opportunity to view this magnificent bird. With heights of up to 4 feet tall and a wingspan ranging 6 to 8 feet, these beautiful birds are quite spectacular to see and capture the attention and heart of even the most novice birder! You’ll find Sandhill Cranes all around the Lodi perimeter and Delta fields and marshes, though there are two favored, local viewing spots. The Woodbridge Ecological Reserve is a designated viewing area, giving you a front row seat to one of the best shows nature has to offer. Sunrise and sunset are prime times to take in the amazing audio and imagery of the Sandhill Cranes flying out in the morning and flying in at night to sleep on their protected flats. Cosumnes River Preserve is also a preferred gathering spot for these cranes and the viewers who enjoy their beauty. The preserve offers a few different opportunities for visitors to see the cranes. Spectators can take advantage of the one-mile Lost Slough Wetlands Walk, sit back and enjoy the Driving Tour, or, for those who want a little different perspective, the river is a perfect place to launch a kayak. 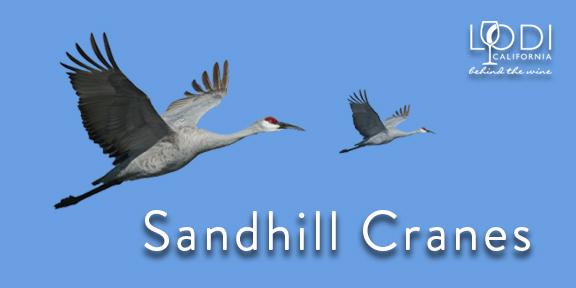 Lodi celebrates the arrival of the Crane with the Sandhill Crane Festival each November. This unique festival offers visitors nature-related educational classes, bus tours and entertainment. Visitors can self-view or sign up for one of many bird watching excursions offered by our local Fish and Game office. The Woodbridge Ecological Reserve (AKA Isenberg Crane Reserve) offers great areas to view the cranes and other fowl. The Cosumnes River Preserve is another favorite among visitors and offers year-round hiking trails along its scenic river. ...and many species of hawks, quail, pheasant, egrets, teals, ducks, geese and woodpeckers. 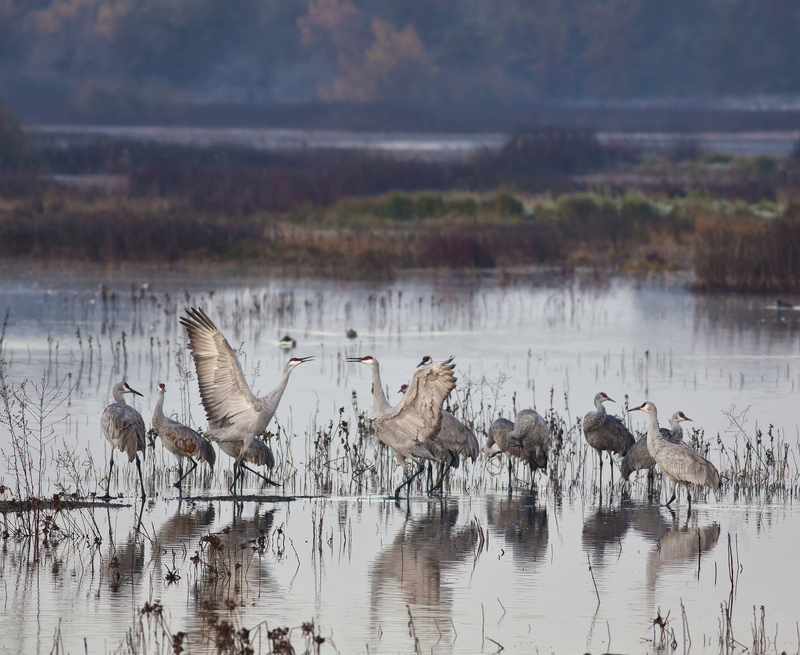 Tours to Lodi-area nature preserves and out into the Delta are the highlights of the Sandhill Crane Festival, and the most popular are the crane fly-ins. Each evening at dusk, hundreds — sometimes thousands — of Sandhill cranes leave the areas where they have been foraging for food and return to their winter roosting grounds at the Woodbridge Ecological Reserve and Cosumnes River Preserve near Lodi, and at Staten Island in the Delta. Volunteer guides share stories about the cranes’ natural history as the stately birds return home for the evening, calling out as they soar through the sky. The popular Crane Roving tour will take you to the birds’ favored feeding spots during the daylight hours. The tour includes a short “fly-over” film of the area as the cranes see it, and volunteer guides explain the behavior of the foraging cranes. Another favorite is Cruising with Captain Morgan’s Delta Adventures, a boat tour that leaves from Tower Park Marina and ventures onto the Mokelumne River to see cranes and other bird life in the Delta. As the double-decked Rosemarie sails Staten, Tyler and Brannan islands in the Delta, a naturalist will be available to identify any wildlife spotted and answer any questions. Be sure to bring a snack or lunch on this four-hour tour; drinks will be available from the on-board, no-host bar. The Department of Fish and Wildlife offers winter guided trips to see sandhill cranes with the aid of a spotting scope donated by Leupold & Stevens. Visit the www.wildlife.ca.gov website for more information. The Festival also features wine tasting, photo and kayak tours. Spaces fill up fast, so reservations are recommended. Hutchins Street Square serves as the hub of activity for the Sandhill Crane Festival. Be sure to stop by the Art Show, featuring the photography of artist Leslie Morris. There will also be presentations and workshops with wildlife experts and photographers, and family-friendly activities like Wild Things! and The Secret Lives of Raptors, which bring rescued wildlife to Lodi. Be sure to catch the taiko drumming performance if you’re at the Festival on Saturday. Featured speakers will be Anne Lacy with the International Crane Foundation, on Saturday; and Wildlife and bird photonaturalist Jeffrey Rich will present the Bald Eagle’s story with his glorious photography on Sunday. Other presentations will cover topics ranging from the “private lives” of Sandhill cranes to creating a butterfly garden. There will also be community art projects: Throughout the weekend, you can learn to fold origami cranes after the Miss Dorothy Presents program; the children are invited to play with the puppets and use the puppet stage. The Exhibit Hall will feature nonprofit wildlife and ecological organizations, along with vendors selling all kinds of items. It’s a great place for some early holiday shopping! While feeding, some cranes will be on the lookout. Your close movement will cause the flock to fly away, using valuable energy reserves. Keep your distance to at least 400 yards. While there may only be a few watching for you, they will all be listening for you. Once you get a good view, sit tight and you're likely to see some interesting behavior. The migratory season of the Sandhill Crane occurs to the delight of both local and visiting birdwatchers. The birds engage in a dance, as well as using a call referred to as trilling, in order to attract potential mates. This yearly spectacle is well worth observing and another reason to plan a trip to Lodi. General admission to the Sandhill Crane Festival is free, as are most of the activities based at Hutchins Street Square. Costs for the nature tours vary. Be sure to make room reservations early as rooms will sell out quickly. For more information about tour times, speakers, sponsors, and the Sandhill Cranes visit the Festival’s website. While in Lodi, visitors can taste at one of our 85+ wineries or dine at any of our tantalizing restaurants. Whether you are coming to Lodi for fun, romance or relaxation, you will find one incredible experience awaits you! Call 800-798-1810 or email the Downtown Visitor Center at info@visitlodi.com today for your free Visitor Guide.